Today we went to Lascaux and Sarlat. We meet at school at 8am to head to La Grotte de Lascaux II. It was raining while we were on our way to Lascaux and when we got there, but after the visit, the rain had mostly stopped. Lascaux II is a recreation of a grotto with cave paintings done by cromagnum. The original grotto was discovered by four boys walking their dog in the 1940s. While they intended to keep it a secret, the entire town of Montignac (just next to the grotto) was talking about their discovery a few days later. They were so excited and proud, they couldn't keep it a secret! In 1948, the original one opened to the public but quickly started being ruined by the change in climate due to visitors, etc. It was decided that it needed to be protected, and so it was closed to the public. Several years later the recreation was begun and eventually opened to the public. It was pretty remarkable to see the bulls, cows, horses, etc painted by cromagnum man. 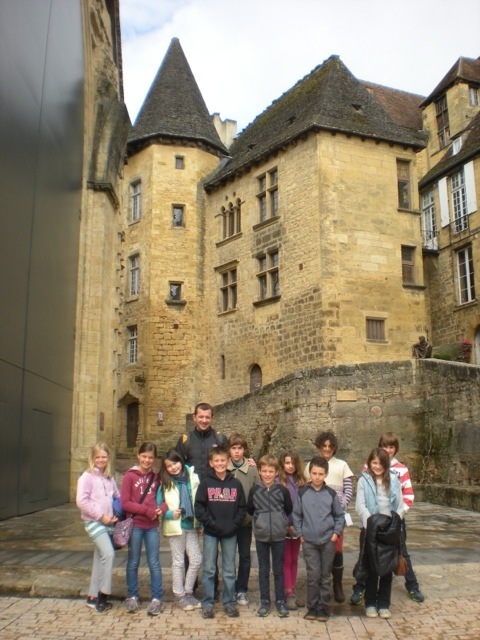 After the visit, we headed to Sarlat. We had a delicious lunch in a crêperie. The kids could not stop talking about how delicious the crêpes were. We each had a savory crêpe followed by a sweet crêpe for dessert. We spent a bit of time exploring and buying some souvenirs before meeting our guide for the visit of Sarlat. 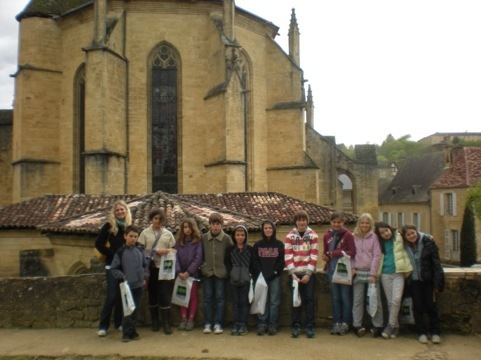 We started at the Cathedrale de Sarlat where we learned about roman, gothic and renaissance styles combined. The students were impressed with the cathedral and were shocked that the organ had 2,583 pipes! The rest of the visit with our wonderful guide Françoise led us through the medieval "ruelles" of Sarlat. After an hour tour, we met our bus and came back to Fumel. Tomorrow we head to Cahors!